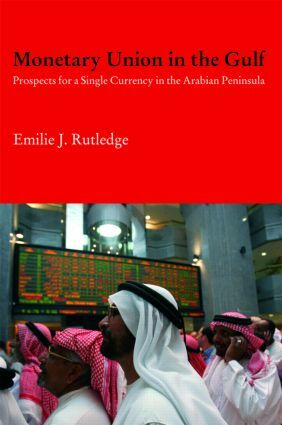 "Emilie Rutledge's new book, Monetary Union in the Gulf: prospects for a single currency in the Arabian Peninsula is the first systematic, book-length treatment of the case for and against monetary union among the members of the Gulf Cooperation Council. It redefines the field of exchange rate economics for the Gulf states and raises the debate to a new and higher level. The book is as excellent as it is timely. Each of the GCC members is engaged in an evaluation of the merits and demerits of the bilateral US dollar pegs that have been the dominant exchange rate regime of the region. Dr Rutledge presents the relevant economic theories clearly and marshals the empirical evidence convincingly. Her familiarity with and deep understanding of the region permit her to address not only the technical, financial and economic issues but also the political economy drivers of the choice of currency regime. This book is destined to become a classic and is required reading for all those interested in exchange rate issues in resource-based economies, a category that is rather wider than the GCC." "This book comes at a crucial and timely moment. Changes in the balance of global economic power, and the huge wealth being accumulated by Gulf states, mean that an effective Gulf Monetary Union would have far-reaching effects on the global economy. Rutledge’s careful analysis of the prospects and requirements is exactly what is needed." Emilie Rutledge is Assistant Professor of Economics at the United Arab Emirates National University. She regularly contributes articles and opinion pieces on GCC economic issues to the regional press. Previously she worked as an economist at the Gulf Research Center, a Dubai-based think tank.